Currently many fans of the Tom Clancy's Rainbow Six Siege are wondering whether it is possible to play the game in split screen mode. Unfortunately, the answer for many is not very satisfying. The split screen mode does not exist in Rainbow Six Siege. Nevertheless, you can hunt terrorists and share your Achievements with your friends. Popular features of its predecessor, Rainbow Six: Vegas, Split screen and LAN functions are no longer available in the latest entry. The game supports only pure online co-op. - Online Co-op: Yes, you can form a team with up to five players. As you can see, the possibilities are limited to play together with your friends. 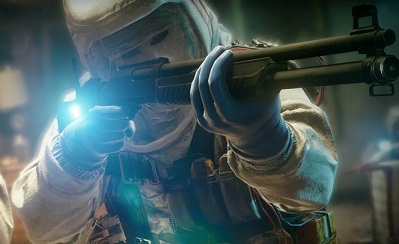 Only available is the online co-op in Terrorist Hunt mode in which you fight together with four other players against the AI terrorists or you can play in multiplayer mode together with five players against other teams.